In recent years ,BRD group has devoted itself to serve the society and these honors have prove it . 4, Whether the order can be delivered on time9 Yes, BRD&rsquo;s mature production management system ensures the order will be delivered on time. 5, How long the order can be delivered9 After your payment, products can will delivered in 4 to 7 days. 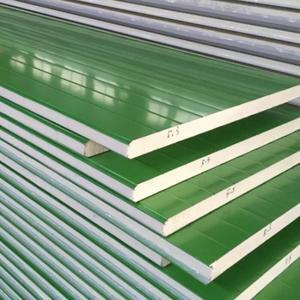 PU sandwich panels for wall and roof YOYCOOL have more than twenty years manufacture experience. 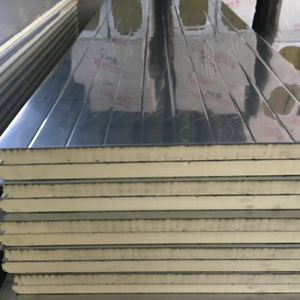 PU as core material, and zinc-plated & color-coated steel sheets& stainless steel sheet & aluminum sheet as the upper and bottom sheets. 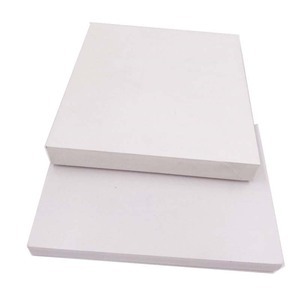 The panels are formed by heating and pressing with high-intensity glue , with high speed continuous line. 5,The preparation of adhesive mortar According to the proportion, and the good bonding mortar should be finished within 1.5 hours. 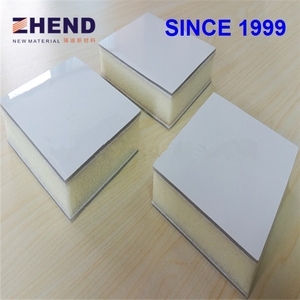 Heat preservation to decorate a whole plate of bonding area should not be less than 50%, using dope putting "box" method. 7,Seven, filling bubbles, paste the masking tape Within the separation seam filling foam, and then paste the masking tape on either side of the seam. 2.How do you guarantee the quality of the products: Strict product quality control, quality makes the future. 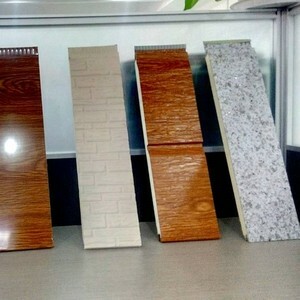 3.What is your difference with other products9 Our product has the environmental protection, beautiful, insulation, fast installation, etc advantages. 4.What's your product can be used for9 Our products can be used for factory,logistics center,warehouse,cold storage,etc. You can create a house in a shorter time! 2.1 Manufacture For this model, we have 2 production lines with 5,000 m2 capacity per day. For more information, please kindly contact. 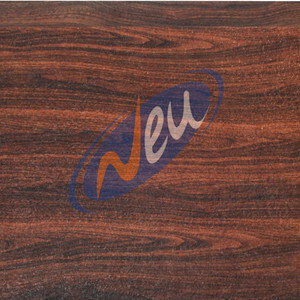 Dalian Tenghui Innovative Construction Materials Co., Ltd.
2. 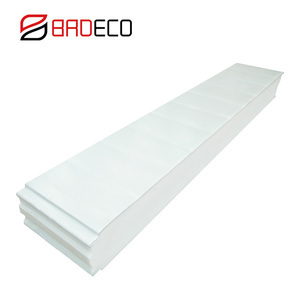 The roof panel connect along the slope, the common length is 25mm, when the slope of the roof less than 1/15, the connect length is 300mm. 3. The connect length of the water guide fittings and the color steel sheet fittings should be more than 60mm. 4. The joint of the panel and the fittings, the exposure of the rivet shall use the waterproof sealant to seal. It can be used as interior and exterior partition on steel or concrete structure building ,for new construction, additions or renovations. Advantages: Light weight, sound insulation,heat insulation and preservation, water proof, fire proof, fast construction, save space and so on. Technical performance indicators Size of panels(can be customized by customers' requirement) Installation ways Projects \ Our customer High quality and low price, zhongcai jianke panel is your best choice! Length (mm): tailored as per client&rsquo;s requirement due to continuous forming production. Advantages: fireproof GB class B Energy consveration,environmental,protection,economical,heat insulting. Feature. USAGE wall and flooring panel for truck body refrigerator where strength ,weight and insultion performance is a high concern. 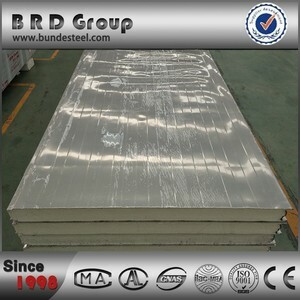 SUPER Company formerly is steel building materials manufacturer only for domestic market in China, over 25 years production experiences, we have good reputation raw material suppliers in China and cooperate well, like BAO Steel, Blue Scope, Yehui, etc as below. After 25 years production experiences, we now have a complete set of workflow. The installation type is secret, its horizontal installation, screw is hided, this panel surface has small rib makes it look beautiful and high strength, below is the detail about installation. Hangzhou IVS Building Material Co., Ltd.
Alibaba.com offers 33,949 materials of polyurethane foam products. About 1% of these are steel pipes, 1% are appliance paint, and 1% are metal building materials. A wide variety of materials of polyurethane foam options are available to you, such as 100% polyester, iron, and fiberglass. You can also choose from bag, car, and bedding. As well as from waterproof, anti-static, and tear-resistant. And whether materials of polyurethane foam is plain, dobby, or jacquard. There are 33,934 materials of polyurethane foam suppliers, mainly located in Asia. The top supplying countries are China (Mainland), United Arab Emirates, and South Korea, which supply 99%, 1%, and 1% of materials of polyurethane foam respectively. 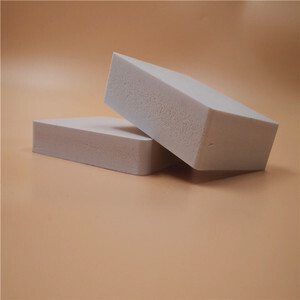 Materials of polyurethane foam products are most popular in Domestic Market, Southeast Asia, and South America. You can ensure product safety by selecting from certified suppliers, including 14,731 with ISO9001, 8,286 with ISO14001, and 2,968 with Other certification.